The Shooters had a really good election result, but didn’t do it thanks to a big sweeping vote across the state. At the moment they are on track for about one quota in the upper house. Yet thanks to the kinds of seats they won, Shooters will now represent more than half of the land mass of NSW in the lower house. In this post I thought I would pull together a map showing the booth results for the Shooters (on a two-candidate-preferred (2CP) basis against the Nats) across the three seats they won. The first thing you can see is how big the Shooters majorities were in Orange. Apart from one tiny booth where the Nationals polled 55% on the edge of the Orange urban area, the Shooters won every other booth in the seat. This translated into more than 65% after preferences across the seat for Shooters MP Phil Donato. Donato polled over 60% in all four council areas, ranging from 62.5% in Forbes to 66.2% in Parkes. Next we can see that the Nationals still won a majority of booths in the eastern side of Barwon. The booth breakdown in my seat guide shows that this area makes up a large majority of the electorate’s population. But the picture is very different in the electorate’s biggest town of Broken Hill, where Shooters polled over 80% of the 2CP vote across six booths. They also won a slim 53% majority in Lightning Ridge in the north of the seat and 55% in Coonabarabran, and won majorities in a bunch of other booths. 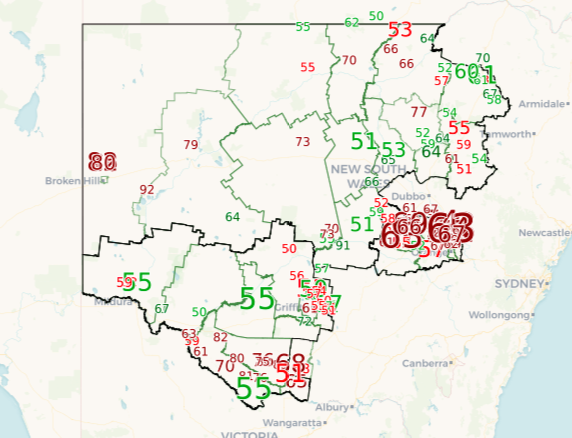 If you look at the areas I defined in my seat guide, the Shooters polled 82.4% of the 2CP vote in Broken Hill, 53.4% in Central, 50.6% in the South-East and 44.8% in the North-East. With the election fought largely to a standstill in the east and centre, and with an overwhelming Shooters majority in Broken Hill, this resulted in an overall 57.6% majority for Shooters candidate Roy Butler. Finally down south we have a mixed picture in Murray. I divided this electorate into five areas. Shooters candidate Helen Dalton won a majority in three of these areas. She polled 77% of the 2CP vote in Deniliquin (the smallest of the five areas). She also did well in the south of the electorate, with over 60% in this area. She also narrowly won the Griffith-Leeton area, which makes up the biggest share of the electorate. She narrowly lost the north-east (47.3%) and the north-west (48.5%). This translated into 53.8% of the two-candidate-preferred vote across the seat. PRior to NSW election I did an analysis of Shooters FIshers and Farmers policies and ws pleasantly surprised how close they were to my own views. I had always regarded them as a fringe party not within the mainstream of Australian Parties ie ALP or to right of ALP or Liberal or to Left of Liberal party. They are not the nutters that main stream media portray them to be. IF Nationals want get my vote or preference they have got to sound like Christiansen and Barnaby Joyce but importantly they have got to vote the same way as they sound,. They do not need to kow-tow to fascism to do this. Moving outside of main stream on most social or economic issues needs careful consideration. Is it the rise of the SFF, or really the rise in the number of people who feel deserved and or betrayed by the Nats? I think some comment about SFF and ON in the media and by the leaders of the declining major parties is near harassment and neurotic. These two parties get a few MP’s elected and get respectable voter numbers but life does not revolve around the so called old parties, be they the Labor or Liberal parties or the smaller Nationals or Greens for that matter. The Menindee booth where the SFF got 94% TPP is extraordinary. The Nats got 7 out of 269 formal votes or a primary vote of 2.6%. Is that the smell of dead fish or a political carcass formerly known as the Barwon National Party? If they don’t defect, the maps for Barwon and Murray will look like Orange in 2023. Nationals are losing ground to Liberals and letting Libs dominate Coalition. Coalition would be out of office without Nats but the last time they wielded a stick was McEwen’s veto of McMahon.